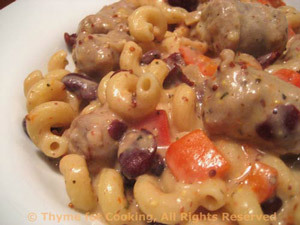 Pasta with Sausage, Mustard, Beans, Thyme for Cooking easy gourmet dinner. I love sausages and peppers together. Add some red beans and pasta and we have a one dish dinner in just 30 minutes. The mustards and yogurt make a slightly hot sauce. Heat oil over medium heat in nonstick skillet. Add onions, peppers and sauté 3 minutes. Add herbs, mustards, wine, stock and beans. Reduce heat to low, cover and simmer 5 - 10 minutes. Stir in yogurt, add drained pasta. Toss to combine and serve.